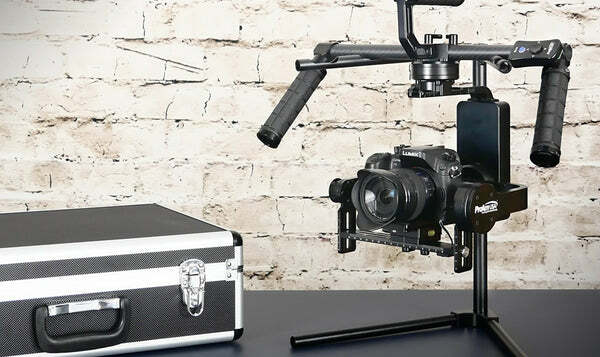 The DigiPilot 3-Axis Handheld Digital Camera Stabilizer from ProAm USA has a triple axis brushless gimbal that eliminates vibrations, allowing you to easily capture smooth, professional looking flying shots. With pre-programmed stabilization, set up time is reduced to get you shooting right away. 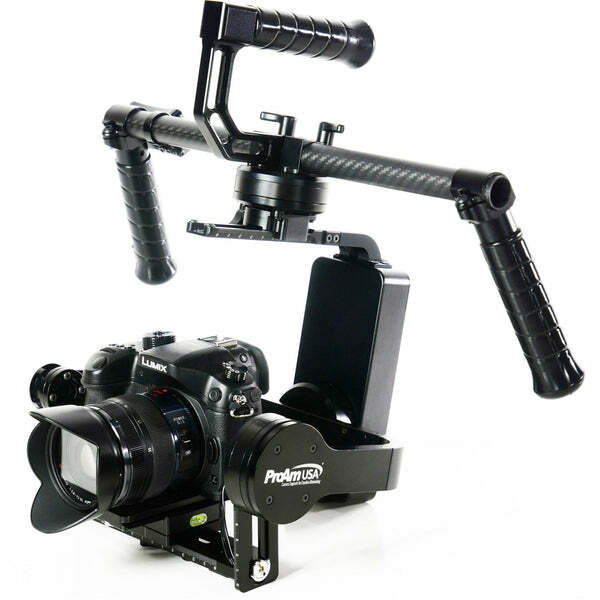 The DigiPilot is a fully digital 3-axis camera stabilizer system created for DSLR and mirrorless cameras weighing up to 4 lbs. Its lightweight carbon fiber body and compact handheld design give you the freedom of movement without the need for post-stabilization. 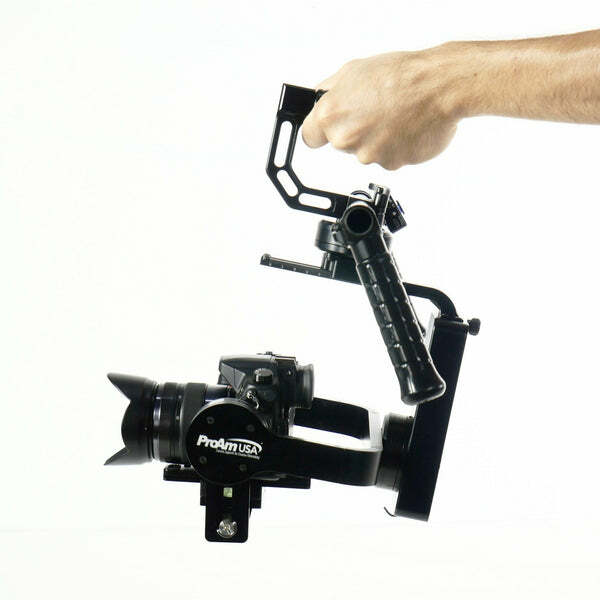 With the DigiPilot, you'll have complete flexibility to achieve effortless, smooth floating tracking shots. The DigiPilot Handheld Camera Stabilizer's digital and brushless motors remove all unwanted camera motion so you can shoot on any terrain. The DigiPilot features several modes of operation for endless shooting styles. Mode 3: Lock Mode – The camera stays locked in one position. Mode 4: Heading and Pitch Follow Mode – The Camera slowly tracks your movements on pan and tilt axis. Mode 5: Inverted Mode – An inverted mode can be achieved by flipping the gimbal upside-down in follow mode or you can restart in an inverted mode. Shipping weight and dimensions: 12 lbs, 19" x 14.5" x 6.75"
will this work with a D810 WITH A 24MM70MM? Unfortunately we wouldn't recommend the Nikon D810 with the 24-70 lens combo as the motors may encounter some trouble moving the weight. The Digipilot works best with lighter-weight mirrorless cameras. Yes, the Digipilot will work great with the XA35. There is 4.25" clearance from the center of the mounting plate. The quick-release plate is 4.75" long so you'll have plenty of room to work with. I would mount the XA35 with at least 0.5" of clearance in the back. It may also be best to remove the handle grip, but there is still 6" of clearance vertically. The camera is lightweight enough that even if you must offset the camera some for clearance purposes, the motors will easily be able to compensate, but I don't expect you'll need to worry about that. Forgot to ask one more question. The batteries shown appear to be similar to an 18650 type of rechargeable battery. Can you tell me the battery types that this rig uses? Thanks again. You are correct, the batteries are standard 18650 type. I have not done full a full set with the 5DII and lens combination, but I'll test how much energy is possible with this heavier setup and update this answer. The benefit of using the 18650's is their availability and affordability over proprietary lithum ion batteries that are used in the DJI Ronins. a 6 pack of 18650 rechargeables is available on Amazon for $18.49 currently. Hi there. I have a couple of questions. From what I can tell, my current rig of a Canon 5D Mark III with a 24-105 f/4 L series lens would push the weight to about 3.5 lbs. I know it shows to handle 4 lbs, but do you think that it's getting a little too close to handle for that DSLR and lens setup? I've used this same setup with a Ronin-M, and though it could handle it, the battery life lasted about 10 minutes due to the weight (it's max weight was 8 lbs.) Also, I run an Atomos recorder with my rig, which requires me to use the camera's HDMI out. Does this rig's configuration block this area on that camera? Any information would be appreciated. Thank you. Thank you for the great questions! I've tested it with a 5DII and Tamron 24-70 lens where the total camera weight was 3.6lbs. Stabilizing works great, but you may have to pay a little more attention to balancing properly since it's near the limit. For lighter cameras, the motors can more easily compensate for improper balanced camera loads. For HDMI out, there is 1-1/4" space between the camera and the arm. See this image. The Mark II and Mark III are the same width of 152mm. I'd recommend a thin, right angle HDMI connector. Hi, I've never used a gimbal, but looking at them now... How is changing the focus & zoom handled while using a Gimbal like this one? Does it have to be done manually, or is there some electronic way of doing this? There are a few ways of keeping the subject in focus when using a gimbal. The simplest method is to use a wider lens which will give you more of the image in focus, and set it up to increase the depth of field (DOF) with a smaller aperture. Then track your subject so that they/it stays within the DOF. You can use the camera's built-in focus peaking tools, or an external monitor to make sure you stay in focus. Next, you could have a smartphone mounted to the gimbal, and with your camera's app adjust the focus as needed. A camera like the GH5 allows changing the focus point by touch screen using the app. Another option is to have a second operator pull focus using either the app or a wireless focus wheel. These have just begun to hit the market and while expensive, are an exciting option for those with the budget and crew. Do you have a list of cameras that have been tested with the gimbal, and are separate firmware updates needed for each camera model? Thank you! We don't have a full camera list, but we have used it with the Panasonic GH4, Canon 5DII and the Sony a7III and a7RIII. As long as the camera load is under 4 pounds, the gimbal will work great with any camera combination. You won't need to update the firmare if you change cameras, but only lightly rebalance it when the weight changes. Is the wireless remote unmountable? And what is the range of the remote, say for using the camera for a car or crane mount where you need pan and tilt control? Yes, the gimbal's remote may be removed from the handle, and it has a range of approximately 30 feet which would work well for vehicle mounted situations.